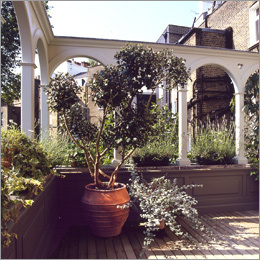 Anthony Christie, a trained joiner and designer, founded Lloyd Christie Garden Architecture over 20 years ago. After receiving a one-off contract for an ornate garden trellis scheme, he realized that there was no dedicated manufacturing base for quality garden structures. This led him to develop an adaptable manufacturing system, which has made Lloyd Christie Garden Architecture the main reference point for quality garden structures. Lloyd Christie has an enviable reputation not only in the UK, but also internationally. Whilst most of our work is based in Britain, we have also completed numerous projects throughout Europe, Japan, Singapore and the USA. Our client base ranges from some of the country's best known and most admired architects and landscape architects to designers of small town gardens and private customers. Whatever your requirement, whether it is a small section of trellis on a boundary wall or a focal point for a small garden, through to an elaborate conservatory, gazebo or trellis scheme, you can be confident that with Lloyd Christie's experience gained over the past 20 years, and the dedication of our craftsmen, you will have a well-designed and skillfully made product.